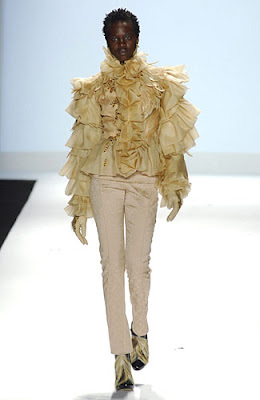 Are you planning a Project Runway-themed Halloween costume? Dressing up as Tim Gunn or Heidi Klum? We'd love to see your "Pterodactyl from a Gay Jurassic Park," or "Garbage bag dress" costume. Please send photos! Click here for Laura Bennett's Halloween column from The Daily Beast. Enjoy BPR Halloween posts from previous years here, and here! Tomorrow night is the launch party for Sweet P's "Ghosts in the Garden" collection! The event is at Havana in Seattle. Click here for more info. The designs are a collaboration between Sweet P and her husband, Sage Vaughn, and will be available for purchase at Pulplab beginning tomorrow. Laura K talks with Kenley Collins, Project Runway Season 5 finalist. You can hear the podcast here. Kenley teaches in New York at Sew Fast Sew Easy. 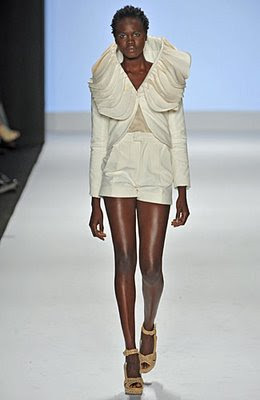 You can see Morgan modeling for Kenley at Fashion Week here. You can shop for her fashions and accessories at KenleyCollins.com. Bravo announced plans for new programming yesterday and several Fashion Reality shows have been added to the line-up. First, "The Fashion Show," which is apparently the new title of "Fashion House." The news is that the ultimate winner will be chosen by VIEWERS and not judges. Casting for the show is right around the corner. Click here for more. Please note that the casting location for New York has changed. Next is "Celebrity Sew-Off" (working title), celebrities will design, cut and stitch their way through a one-of-a-kind creative competition to determine who has the vision to go from icon to fashion star, and launch a trendsetting clothing label. The celebrity contestants will each be paired with an industry expert, who will supply the technical know-how to implement the celebrity's creative vision. Plenty of celebrities would like to be in the fashion industry. It will be fun to see them try. Next, In a new genre for Bravo, "Fashionality" (working title) is a weekly one-hour series, featuring four eclectic New York tastemakers from the worlds of media and fashion, who explore the intersection of all things pop culture and fashion via field pieces, roundtable debates, interviews and a thorough dissection of any and all things stylish and glamorous. From the latest in high fashion to animated debates on the week's red carpet outfits, and with segments like "Bravo Buzz" that explore style trends on the channel, viewers will never look at clothes the same way again. Photo: Finlay Mackay for The New York Times. Thank you Marsha, Nancy and Barb for forwarding this fabulous profile of Lauren Zalaznick. BPRs pour a cup of coffee and enjoy! BPR Field Reporter Nancy T attended Daniel Vosovic's Book Launch party last night at Vlada in NYC. She sends us these great videos of Daniel! Daniel Vosovic at Book signing party from Nancy T on Vimeo. Click here for more including an interview with Suede. Click here to order Daniel's Book. Click here for Daniel's Book Tour Schedule. 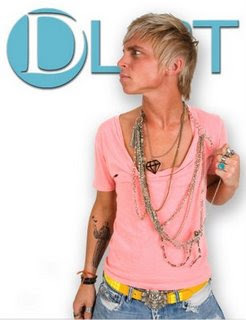 Blayne Walsh is featured in Seattle's DList magazine. There is also a fashion spread inside. Click here to see photos. "Fashion House" is casting in Miami on November 8th. Click here for more. 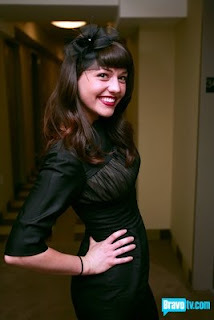 Modcloth features a new interview with Kara Janx. Kelli Martin is preparing for a fashion show in Columbus on November 21st. Nick Verreos previews the new Marc Jacobs line. 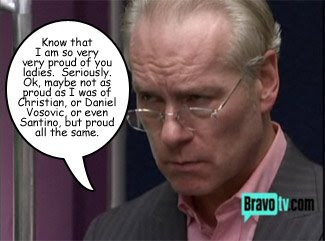 Did Bravo Sabotage Project Runway by Failing to Promote Season Five? The latest action by The Weinstein Company includes the accusation that Bravo deliberately damaged the brand by failing to promote Project Runway. NBC responds that season five ratings were higher than for any previous season. Click here for a review of the latest round. We are wondering what YOU think. Yes, Amanda is REALLY tall! How about a caption for this photo with Blayne Walsh? Suggestions? 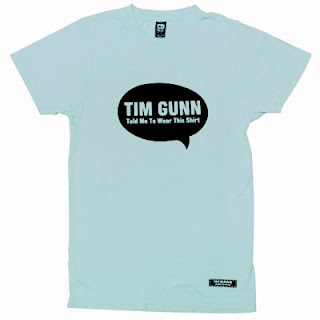 Check out this new Tim Gunn T-shirt here. Ready for Halloween? Kelli Martin shares costume tips here. Did you catch Jeffrey Sebelia's appearance on VH1? He was a judge for a fashion show on "Rock of Love Charm School." If you missed it, there are repeats all week. Check the schedule here. Laura Bennett shares her figure-slimming secrets on The Daily Beast. 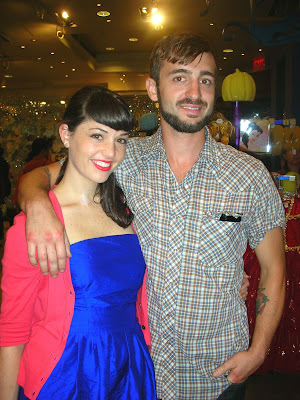 BPR Field Reporter Tina G, the Boston Sewer met Jay McCarroll in the Free Spirit Fabric booth in Houston. Thank you for your report, Tina! You have heard that Jay McCarroll has designed a line of fabrics for Free Spirit. I had already planned to go to International Quilt Market/Houston when I heard that Jay had designed a line and was going to be there! Of course, as a quilter, textile designer, and PR fanatic, I knew I had to go and meet Jay. International Quilt Market, for those of you who don't know, is the main convention for quilt shops, fabric houses, and designers -- basically, anyone who has anything to do with the world of quilting. Fall Market is always held in Houston, while Spring is held in other cities. If you think this is not a big deal, think again. Each season, there are two shows in one -- Market for the trade, and Festival for the general public. In 2007, there were 54,000 people at Fall Quilt Festival in four days. Yup, quilting is a big thing. Thankfully, my two favorite worlds, fashion and quilting have converged in the form of Woodland Wonderland and Garden Friends, Jay's new fabric lines! 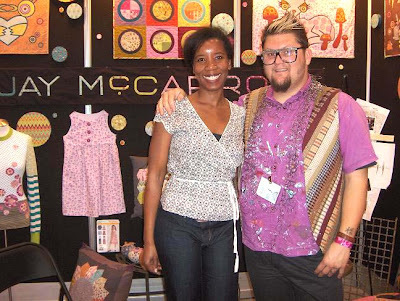 Jay was the first person I sought out when I hit the market floor full of fabric and sewing machine vendors. I was surprised to find that he had an entire corner booth to himself, but not surprised to see that there were several people who wanted to talk with him and take pictures. When it was my turn, Jay was so nice and so personable and easy to talk to. I told him that I loved his finale collection on PR and that I noticed that some of the pieces were quilted. He thanked me and told me that he grew up with quilting. He said that he found everyone in the quilting world to be really friendly. He also had nice things to say about Team BPR and Laura K, and all that she does to support the PR designers! 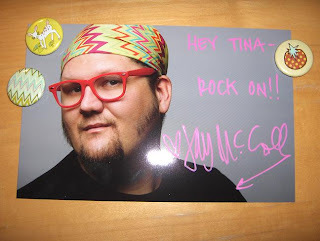 Jay was only too happy to take a picture with me and give me an autographed picture. He also offered me some button pins, made up of the lovable little creatures in his line. My time with Jay was short, as a Free Spirit representative came up to talk with Jay about what sounded like a new fabric line or a twist on the current ones. It is a trade show, after all, and I wasn't buying, so I had to step aside. We wish Jay great success in his new endeavor! Read about Jay and see his new fabric line here. Christian Siriano is profiled in this Wall Street Journal article. Click here for the latest from Project Courtroom. Sigh. 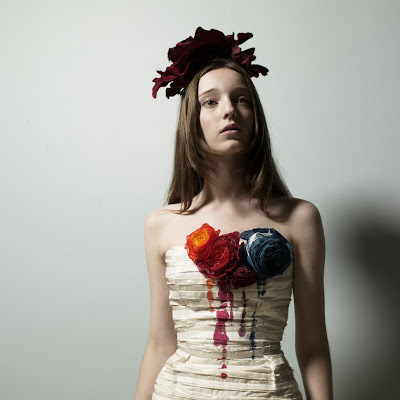 Can Kenley Collins make it as a designer? Check out Page Six. Santa Monica, California – The Santa Monica Public Library is pleased to present an evening with fashion figure and Project Runway star Daniel Vosovic on Thursday, November 6, 2008, at 7:00 p.m., in the Main Library’s Martin Luther King, Jr. Auditorium, 601 Santa Monica Blvd. Well known to fans of the hit reality series Project Runway as one of the second season’s top designers, Daniel Vosovic (or Daniel V. as he was known on the show) now translates his classic and elegant fashion vision to the publishing world with Fashion Inside Out: Daniel V.’s Guide to How Style Happens, From Inspiration to Runway and Beyond. 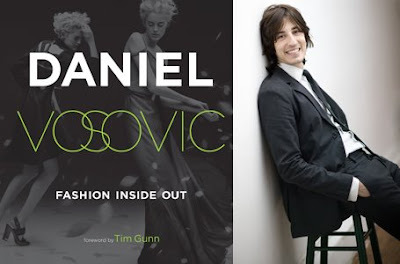 Aided by the breathtaking photography of Michael Turek, Daniel chronicles the entire process of fashion from its creative idea in the designer’s mind all the way to the runway and on to the marketing of the garment in clothing stores and boutiques. Daniel will be joined onstage by fellow Project Runway finalist Sweet P and other guests to be announced to discuss how style happens for them. A book sale and signing will follow. Admission is free. All ages are welcome. Seating is limited and on a first arrival basis. The Santa Monica Public Library is wheelchair accessible. For special disabled services, call Library Administration at (310) 458-8606 at least one week prior to event. For more information on this and other Library events, contact the Santa Monica Public Library at (310) 458-8600; or visit the Library’s web site. Since receiving this press release, BPR has learned that Sweet P will be joining Daniel V on the panel! Bravo announced its plans for a new reality show called "Fashion House" in July. We mentioned it again in September when the casting news went out. Now the dates and times have been set. Auditions will be held in Los Angeles, Miami, Chicago and New York. Click here for more. Good luck designers! On October 11th, I was fortunate to attend "Native Sons," an exhibition of new works by Sage Vaughn. These paintings and sculptures were representative of the search for true beauty in everyday city life. Sweet P was glowing even more than usual, so proud of her hubby! Many Elves were in attendance as well as a few PR alum. Christina Applegate and Anthony Kedis came as well! This one is pretty easy. Can you identify the designers and seasons as well as the model? 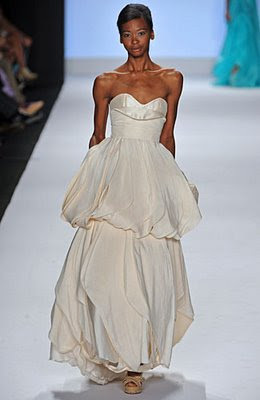 This model walked for Rami and for Kenley. Can anyone identify her? Thanks Ali. Nick Verreos is busy preparing for the Islands of the World Fashion Show. Click here for an update. 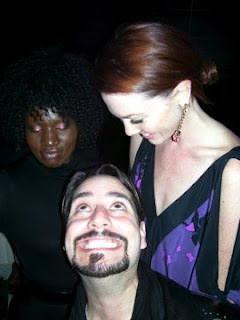 Check out Sweet P's blog for more from the Project Runway Season Five Wrap Party. Click here for a link to Jennifer Diederich's Runway Show from Syracuse.com. Daniel Vosovic talks about his new book and answers reader questions at Craftzine. First, just in case you missed it, here is Leanne Marshall on Craig Ferguson. Tonight at 9:00, check out the True Hollywood Story of Heidi Klum on E! 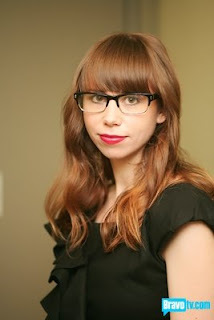 Modcloth features new interviews with Alison Dahl (Kelly) and Kenley Collins. Brad Walsh recently photographed Kit Pistol and Sweet P while he and Christian Siriano were in Los Angeles. My Top Chef interview is up! Laura K. talks with Season 5 finalist and fan favorite Korto Momolu. Click here for the podcast. Click here for her web site. Click here for the MySpace page for Joshua, the composer of her finale music. Check back with us next Friday for our podcast with Kenley Collins. It was my pleasure to meet and to interview Stephanie Izard today in Scottsdale. We met at Digestif and enjoyed delicious salads. Stephanie is in town for eats3 this weekend. Please stay tuned for my full interview at Blogging Top Chef. Meanwhile, if any of our readers would like to meet up at eats3 or at Scottsdale Fashion Week, please let me know! 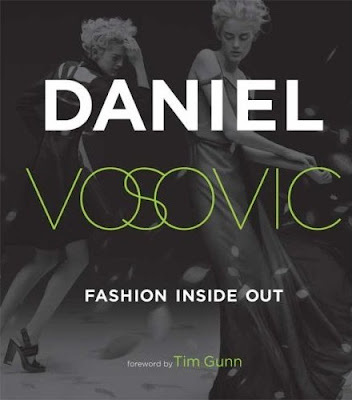 Daniel Vosovic's book, "Fashion Inside Out" is amazing. When Daniel first let us know that he was writing a book, I didn't know what to expect, but this is far beyond anything I might have imagined. The book describes the entire process of creating fashion. Inspiration, sketching, swatching, fabric selection, pattern-drafting, draping, fitting, sewing, finishing, styling, modeling, photography, and marketing are all covered. This book is gorgeous. The graphics and photos are gorgeous and if you are a fan of Daniel's, you will be delighted. There are lots of portraits and the book is clearly in his voice. In addition, Daniel has brilliantly interviewed many many industry professionals. Each one speaks to a particular area of expertise. 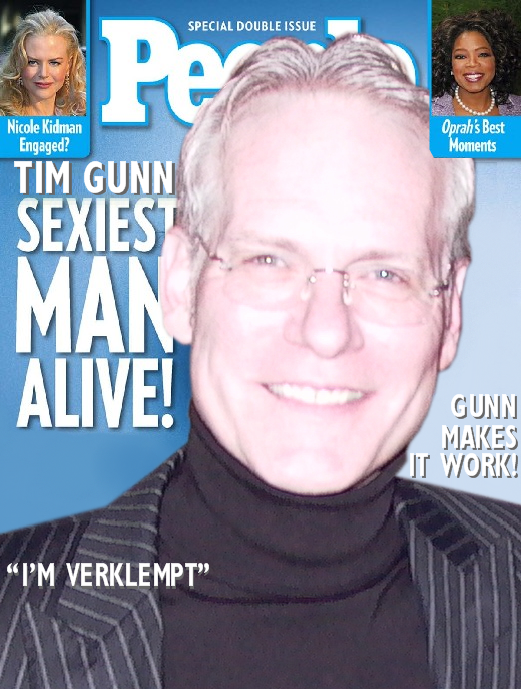 Project Runway fans will particularly enjoy reading interviews with Tim Gunn, Nina Garcia, Heidi Klum and Fern Mallis. This book would be an ideal gift for an aspiring designer or for any fashion fan. It's completely and charmingly fabulous. Kind of like Daniel. 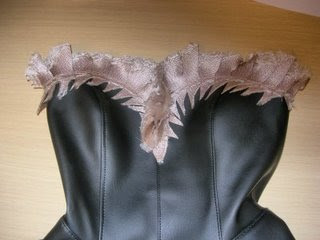 Were you wondering exactly what the "manufactured" version of Suede's winning dress would look like? I know I was. It seemed like it would be a real challenge to capture the handcrafted nature of the design. Well here it is! Isn't it great? It looks just like the original - maybe better -modeled by Nicole Donnelly. Click here to read more. Thanks for sharing your photo, Nicole! Speaking of Suede, click here for a new interview. Thanks Jamie. Korto Momolu will be the special guest tomorrow on Reality Check Radio. You can listen live and even call in with your questions. Click here for the website. In our final poll for Season 5 of Project Runway you agreed with the judges. The majority of you felt that Leanne Marshall deserved the win. Click here to see the results. Why yes, yes it is! Season 5 of Project Runway may have come and gone but you will still find Team BPR here keeping you posted on the latest developments for Season 6 and all the news about your favorite designers from seasons past. Tonight also marks the debut of Stylista on the CW at 9:00 p.m. and we have joined forces with The Minx once again to give it the BPR treatment at Blogging Stylista. And the party of course continues at Blogging Top Design as Season 2 begins to wind down. Come join us tonight at 10:00 p.m. for even more designig drama. Today's Trivia Contest Prize package has been generously provided by our friends at ProjectRunway.com. This package includes a season three DVD, a "Carry On" Canvas Tote, and a Leather Presentation Case. 1. How many of the designs in Kenley's collection were painted? 2. What is the name of Tia's dog? 3. How many hours of sleep did Leanne lose over her collection? 4. Rami Kashou "believes in" _________. 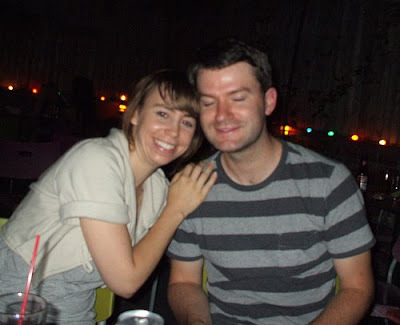 5. Who does Heidi refer to as a "really hot hottie?" 6. Whose collection did Nina Garcia say was "couture-like?" 7. During model casting, Korto looks for girls with _________. 8. There is a fourth person at the table during model casting. Who is it? 9. Collier Strong works for __________. 10. Heidi "wouldn't be caught dead in" ________ ________ ________. 11. Kenley says Leanne's collection is _________. 12. Before Tim sits down in the front row, he kisses ______ ______. 13. The inspiration for Korto's line is _________. 14. In make-up, Kenley wants her models to look like ______ _____. 15. What color is the dress that Nina wears to the finale show? 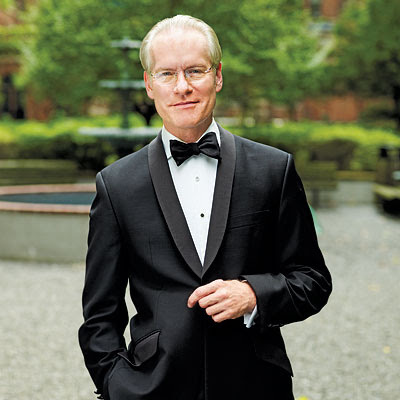 Tim Gunn reveals his favorites at InStyle.com. Also check out the "Ten Essential Items" and behind-the-scenes photos from Guide to Style. There are a couple of seats left at Malan Breton's show tonight. Click to enlarge photo for more info. Leanne Marshall will be on the Late Late Show with Craig Ferguson tonight. More Project Courtroom drama here. A false MOOD storefront in Los Angeles? Because the Los Angeles MOOD was an hour away? Nina and Michael in only a "handful" of episodes? and even fewer together? Whose idea was it to take the show to Los Angeles? Attention NYC: Check out Jerry Tam's FORM collection tomorrow evening. Nick Verreos wraps up Season Five with a brunch and a party in NYC and then another Finale Viewing party in Los Angeles. Speaking of editors, Glenda Bailey apparently preferred Kenley's collection. Will we see the Kenley Collins collection in Harper's Bazaar? Austin Scarlett weighs in on the wedding challenge. I adore you and thank you for your unending support. I appreciate all of your questions! This week was LA Fashion Week so I am just now getting down to business for y'all! Q: From UsernameTX: What do you think the models would suggest in general for 1) suggestions for challenges; 2) improvement in working conditions; 3) any suggestions for changes assuming the show really does move to Lifetime? If it is a competition for the models as well, re-pick models for ALL the designers every episode! PLEASE! Sometimes the winning designer just wanted to remain loyal to their good model and ANOTHER good model had to go. Not fair at all. Working conditions were fine. It was just unfortunate that we weren't paid. The only reason other models had complained about their days on the set is because of that. If they were making money they wouldn't have anything to complain about. Some would disagree, but I don't think so! As for changes, I wish that it would stay the same and stay on Bravo and be produced by Magical Elves!! Of course, this is not the case. Network switching is still up in the air as far as I know. 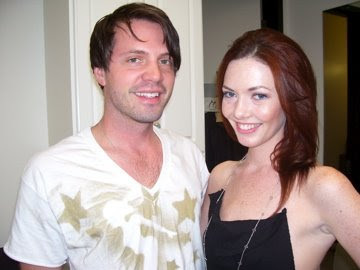 The music Leanne Marshall used in her runway collection was composed by her boyfriend, Nathan McKee. The music, 'Cookie Breath' can by heard on his MySpace and can be purchased at his Etsy shop here. Thanks to all of you fabulous recappers for a season filled with laighs and fun. See you in season 6? Kenley's sweetheart Zac Penley (!) and his band, Small Birthday composed and recorded her runway music. Click here to visit the band's MySpace where you can listen to the song and click here to purchase it. Thanks Kenley. Rami Kashou received a special honor at the American Task Force on Palestine's Third Annual Gala. Click here to see a video of his speech. Leanne Marshall Celebrates Her Win! Heidi Klum stars in the newest "got milk?" ad campaign. Adorable! Click here for more info. More than seven million viewers watched the finale of Project Runway on Wednesday night. Click here for more. Click here for an interview with Kenley Collins. Don't miss Lisa Gilpin's Finale blog entry at Bravo.com. Don't miss Heidi yodeling at the end of this video. Hee. I guess there's a good reason she calls herself "the silent fashion assassin". 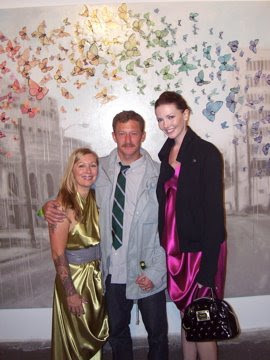 Leanne Marshall entered Season 5 of Project Runway as quiet as could be. But week after week she continued to turn out interesting designs that were well constructed and almost always met the parameters of the challenge. And one by one her competitiors fell, not by her words, but by her talent. In "The Fashion That Drives You" Leanne created an adorable strapless minidress out of Saturn seat covers with a neckline of feathered seatbelts. It was a brilliant solution to the challenge and if you didn't know any better when you watched Karalyn West walk this down the runway, you couldn't guess by looking at it that it was made out of automotive parts. 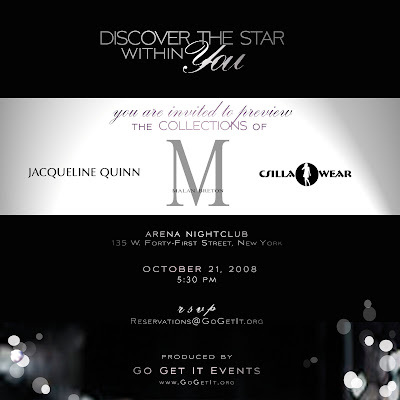 Michael Kors proclaimed that it was "Thierry Mugler meets John Galliano" and it clinched her first win. This look was also a departure from her signature wavy pleats and is evidence that she is far from being a one-note. Leanne of course would go on to collect the big check and the car keys after her lovely finale collection at fashion week. You also chose her to have the honor of creating the Top Look of Season 5. Congratulations Leanne! ...into this whiny tearful mess? Project Runway season one judge, Anne Slowey returns to television in a new reality show, "Stylista" on the CW premiering next Wednesday night at 9:00. I watched the screener of the first two episodes and I am completely hooked! I already have my favorites - and there is quite an interesting villain...or two... Please join us at Blogging Stylista. 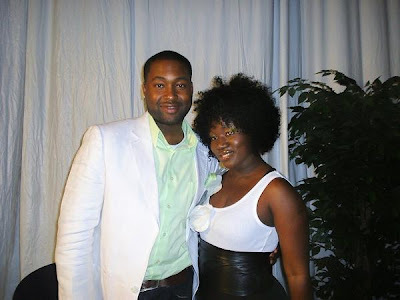 Fan Favorites - Korto Momolu with Mychael Knight. Click here for more. Project Courtroom update: Lifetime enters the proceedings. Here is a little more from Heidi. 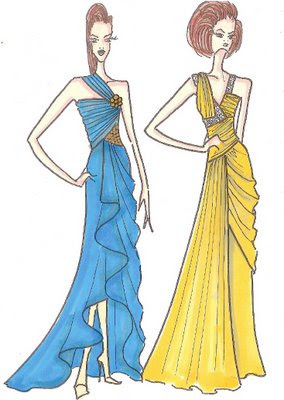 Click here to go behind the scenes at the Project Runway Season Five Finale with Team Bluefly. Click here to read Jack Mackenroth's blog entry about Project Inform. 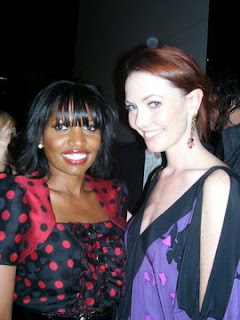 Laura K. talks with Project Runway Season 5 winner Leanne Marshall. Click here for the podcast. Next Friday we will present our podcast with Korto Momolu. BPR Fan Favorite is Kelli Martin!